The Knowles Collection: Captain Ben L. Salomon, Congressional Medal of Honor. Captain Ben L. Salomon, Congressional Medal of Honor. At one time or another most researchers are guilty of not digging deep enough when putting together the history of an ancestor. We have spent so much time digging into their past that once we identify them we quickly move on to the next generation. 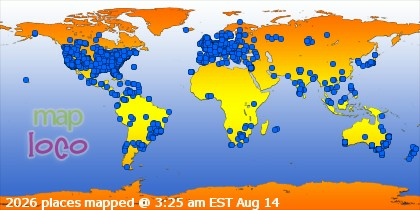 Yes, we want to find the entire family but what have we left behind, what have we overlooked? 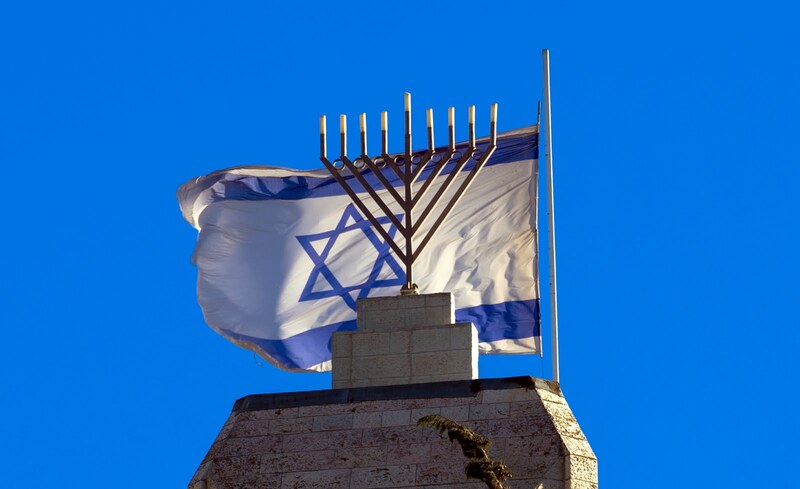 Ancestry.com has a wonderful database on there website, U.S., WWII Jewish Servicemen Cards, 1942-1947. In doing some research in that database, I found the record of Capt. Ben I. Salomon. The card gave the basic information, informing us that Capt. 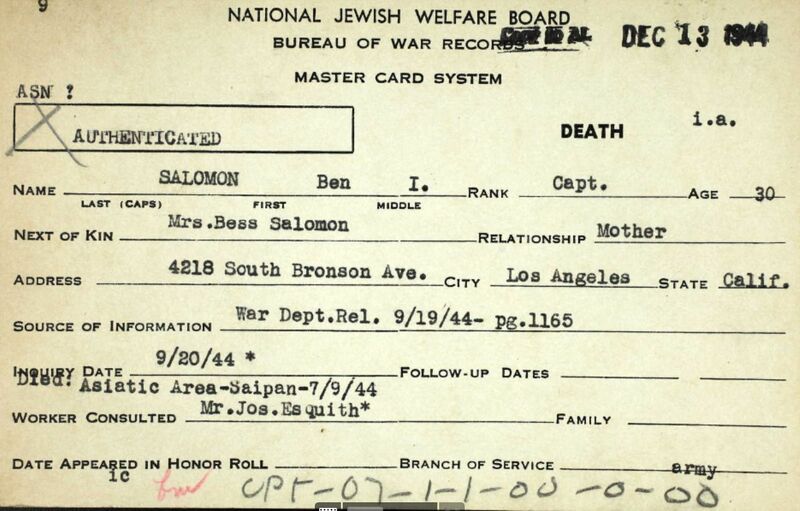 Salomon, age 30 of Los Angeles, California, the son of Bess Salomon, was killed in action on 9 July 1944. He was killed during the Battle of Saipan on the Marianas Islands. 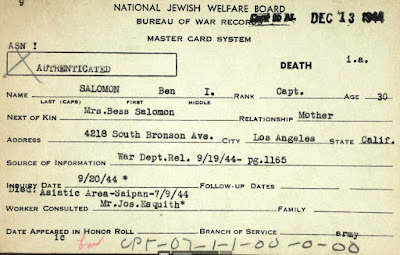 The information provided on this card does show that Captain Salomon was a hero who gave his life serving his country, yet there is so much more to the story. On 1 May 2002, almost 70 years after his death, Capt. 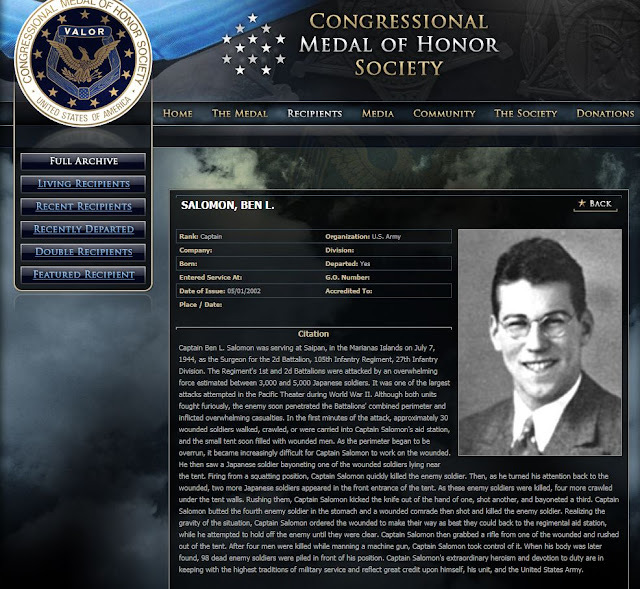 Salomon was awarded the Congressional Medal Of Honor. In the citation with the award (shown in its entirety below) his actions in protecting and saving the lifes of the wounded who were in his aid station are documented. He truly is a hero, and his actions that day should be read by all as an example of paying the ultimate sacrifice for others. May his name always be remembered and may we always try to document the complete story.